We would like to give a special word of thanks to Cathedral Financial Consultants Limited, Dundalk, Co Louth. We will be beach ready for next year, thanks to their kind donation of a floating beach wheelchair. 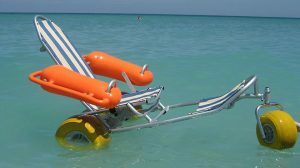 This will mean we will be able to take our wheelchair users to the beach and even let them have a swim, this wouldn’t be possible without this piece of equipment. Now all we need is the sun to shine next summer!!! Cathedral Financial have been supporting our centre since we opened in 2014, we greatly appreciate your continued support.